From its entry into Milwaukee in 1889, the Salvation Army has pursued its two-part mission to “preach the gospel of Jesus Christ and to meet human needs in His name without discrimination.” Captain Samuel Neil, his wife, and four companions established Milwaukee’s first Salvation Army center on what is now North Plankinton Avenue. 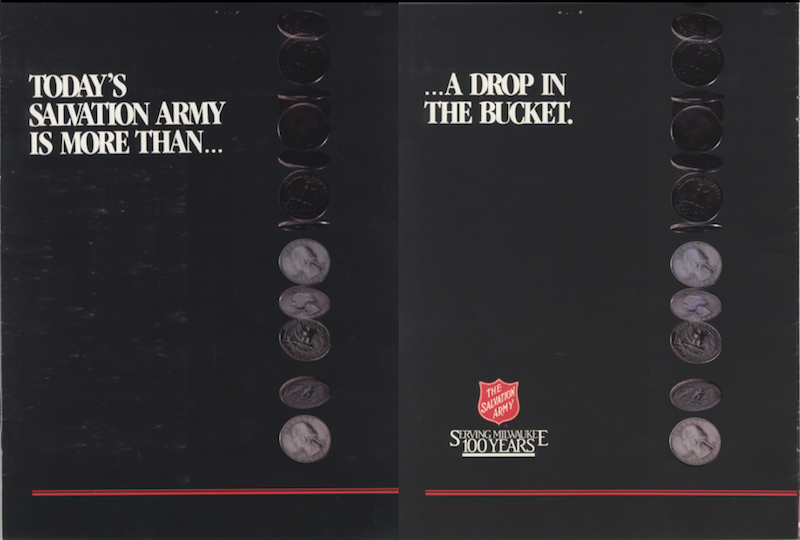 In 1893, the Milwaukee Salvation Army held its first red kettle drive, and a decade later the organization opened the first of its Milwaukee-area homeless shelters and thrift stores. The Milwaukee Salvation Army’s charitable services range from food pantries and thrift stores to children’s programs, housing services, and disaster relief. Throughout the tumult of the 1960s, the organization attempted to remain apolitical in its social services. This goal to provide services regardless of race may have helped the organization’s 25th Street offices to come through Milwaukee’s civil disorder of 1967 unscathed. In 2015, the organization provided 46,839 nights of lodging at its emergency shelter. The annual Christmas Family Feast dinner at the Wisconsin Center is one of the largest Salvation Army Christmas meals in the country, and the organization’s Milwaukee Feed the Kids program provides over 2,300 meals daily during the summer. The Wisconsin and Upper Michigan division of the Salvation Army is headquartered in Wauwatosa and consists of twenty-six community and worship centers. As of 2016, the Salvation Army maintains four worship centers in Milwaukee County and one in Waukesha County. In 2010, there are over 2,300 Salvationists in the greater Milwaukee area. ^ “Mission Statement,” Salvation Army Milwaukee County, accessed August 2, 2016; “History,” Salvation Army Milwaukee County, accessed June 29, 2016. ^ “History,” Salvation Army Milwaukee County; “Street Name Conversions,” Milwaukee County Historical Society, accessed August 2, 2016. ^ “History,” Salvation Army Milwaukee County. ^ E. H. McKinley, Marching to Glory: The History of the Salvation Army in the United States, 1880-1992, 2nd ed. (Grand Rapids, MI: William B. Eerdmans Publishing Company, 1995), 261. ^ “Help for Today, Hope for Tomorrow: Milwaukee Social Services,” Salvation Army Milwaukee County, February 2015, accessed June 29, 2016. ^ Annysa Johnson, “Salvation Army Christmas Dinner Needs 400 More Volunteers,” Milwaukee Journal Sentinel, December 1, 2014; “The Salvation Army’s Christmas Family Feast,” Wisconsin Center District, accessed August 12, 2016; Faithe Colas, “Summer Essay: Lunch Truck,” Milwaukee Magazine, June 6, 2016. ^ “About Us,” Salvation Army Milwaukee County, accessed June 29, 2016. ^ “Contact Us,” The Salvation Army: Milwaukee County, accessed August 1, 2016; “Home & Master Calendar,” The Salvation Army: Waukesha, accessed August 1, 2016. ^ Association of Statisticians of American Religious Bodies, “Metro-Area Membership Report: Milwaukee-Waukesha-West Allis, WI, Metropolitan Statistical Area” (Association of Religion Data Archives, 2010), accessed August 1, 2016. McKinley, E. H. Marching to Glory: The History of the Salvation Army in the United States, 1880-1992. 2nd ed. Grand Rapids, MI: William B. Eerdmans Publishing Company, 1995. Winston, Diane. Red Hot and Righteous: The Urban Religion of the Salvation Army. Cambridge, MA: Harvard University Press, 2000.